Yeah, I have never had to do anything shady, I have seen guys doing things to CYA, but not this shady. This is why I love ATS!! I am about the least computer literate person you will ever meet, so I was wondering if someone could answer a couple of questions for me. First, do you have to give personal information to get a Reddit account, ie is there a trail of proof the people have a reddit that definitely proves its Combetta? (Right now it seems as if it is him, but the info I am mentioning would 100% prove it). Secondly, would it be possible to put a sort of retroactive time stap on that site? In other words, could someone have say this week posted as Stonetear on reddit but used some sort of program to make it look like it happened in 2014? If all of this proves top be true, it shows. 1. Combetta was intentionally violating the law. 2. He is claiming on these posts he is being instructed to do so which means someone higher up like Hillary ordered him to do it. 3. The FBI is either incompetent or corrupt in that they couldn't find this information. If this is proven, charges should immediately be brought on Hillary, and Comey and others working on this investigation should be fired and investigated for their role in a cover up. Ill be making popcorn for the rest of the day. You are assuming 2 things. 1. Clinton purchased MS support for a server she wasnt supposed to be runinng. 2. 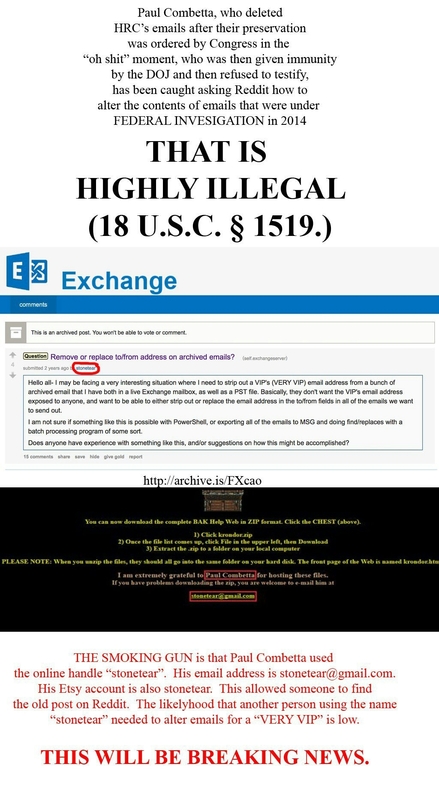 That the use of reddit wasnt to "hide" the question, as MS would keep detailed logs of the support interaction. Thanks for the info! I too will be watching this with baited breath. I also assumed he was a govt employee. I now see he was a contractor for Hillary. I suppose a good admin would have figured out anyway. Ok, I am anonymous here. Really, this would have been so easy to do. Hardware does fail, databases to become corrupt and unreadable. Shirt off and looks like he does take pictures from the basement.